A portable battery charger is commonly referred to as a power bank and can be handy when you are on the move. It helps you stay connected through your smartphone or tablet when you do not have the facility to charge them using your normal charger like in the case of power failures or outages. A power bank usually comprises rechargeable lithium-polymer or lithium-ion batteries encased in a protective housing. The housing also features an LED indicator that notifies the user about the charge remaining in the power bank. The portable battery charger contains one or more USB ports that indicate the number of devices it can charge at a time. The following are some of the best battery chargers you can buy. 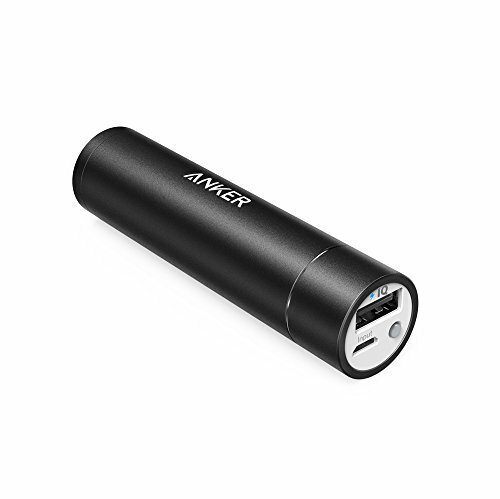 The Amlinker portable battery charger has two USB ports to charge two devices at a time. The charger has a total current rating of 5.5A and an input/output voltage of 5V. A fully charged device can charge a smartphone around five to seven times and a tablet two times at full speed before it needs a recharge after around a week. The portable charger has an inbuilt LED flashlight that can act as a torch in times of emergency or in the dark. It comes with a massive 20,000 mAh battery and a blue light. This blue light keeps blinking when the charger is getting charged and remains steady when the device is fully charged. The charger comes in black, blue, pink and white color variants. The handy battery charger comes with a micro USB charging cable and a 12-month warranty or a 30 days money back guarantee. Remember to charge it fully before you use it for the first time. 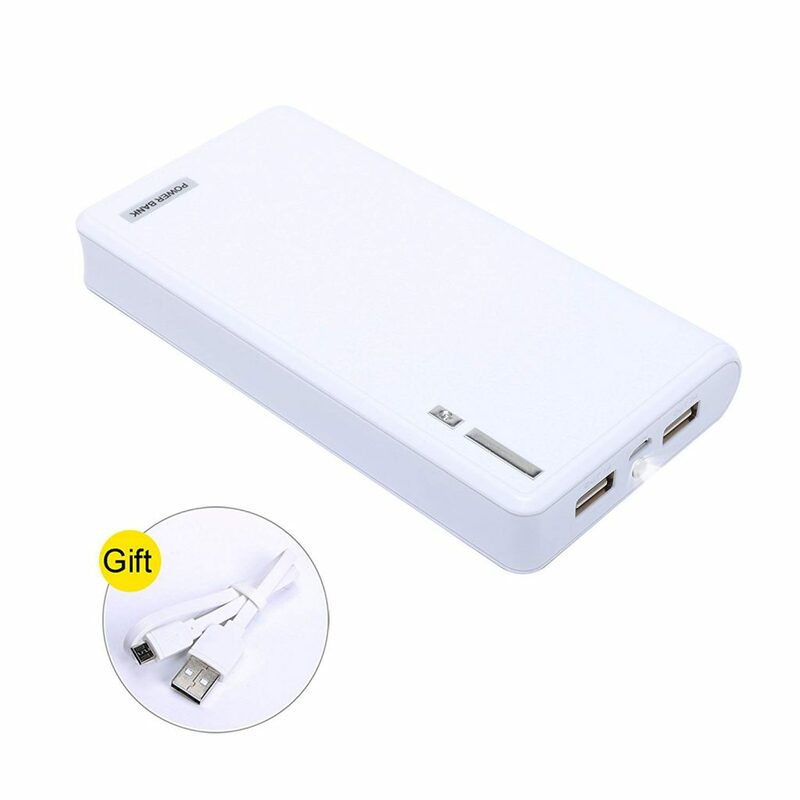 The power bank is ideal for people wishing to charge both Android and iOS powered devices. The Amlinker accessory is worth considering by those who want to save charging time by using both the ports together. The different colors available make it ideal for those who want a different color option instead of the standard black and white choices. The power bank houses four Type C USB ports with an LED display screen. 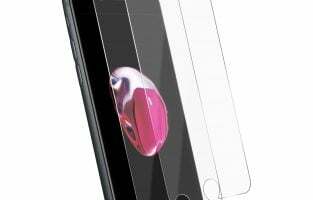 The display screen comes covered with a protective plastic film to prevent scratches. You must remember to remove the film before you start using the charging unit. The device also has a powerful LED floodlight on its casing that you can turn on by pressing the Power button twice. It comes integrated with input overcharge protection technology for the safety of the items getting charged. 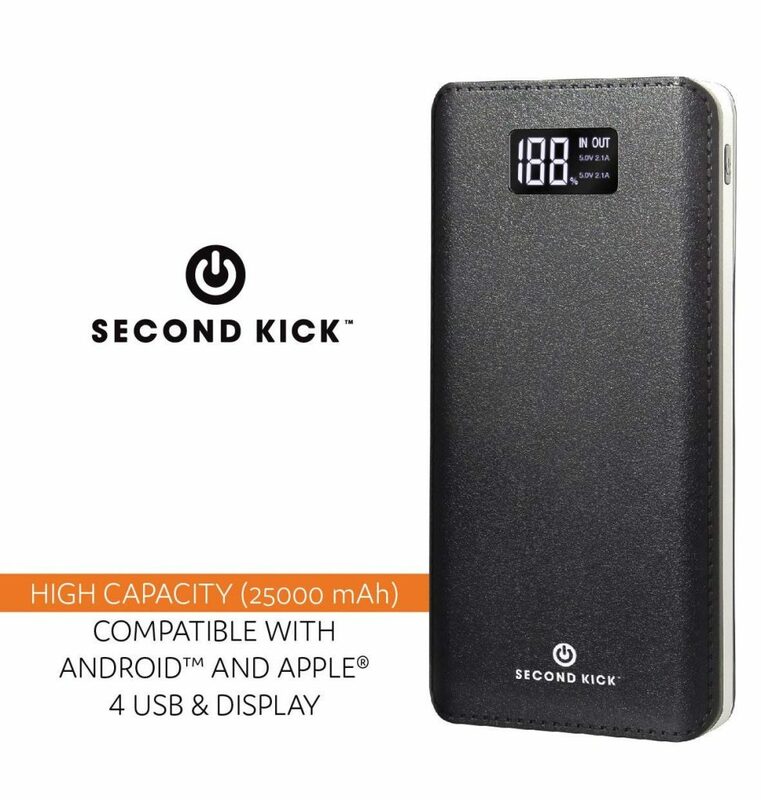 The Second Kick portable battery charger houses a huge 25,000 mAh battery. A fully drained charger takes a little more than eight hours to attain full charge. The black and silver colored battery charger come with a textured casing that is made of polycarbonate and ABS. It requires one lithium-ion battery for operation. The device works well with both Apple and Android devices. The Kick Start power bank is worth considering by people who wish to know the exact battery level remaining because of the LED display indicator. The accessory is ideal for those who are particular about owning a durable battery charger. This differently shaped power bank is ideal for those who wish to charge only one smartphone at a time. It can also charge other devices like iPods, music players, digital cameras and Bluetooth headphones and speakers. The charger comes with a multi-protection feature that protects the charging unit from over-voltage, over-charge, output short circuit, high temperature and over-discharge. The battery charger has an auto-sleep mode and an automatic dormancy mode that prevents the power from getting drained when it is not in use. The device has a red LED light indicator that keeps flashing when it is getting charged and turns off after charging. The blue LED light remains on as long as you charge a smartphone or another device. The portable battery charger is available in various color and designs with a polycarbonate body. It comes with a reliable Grade A 2,600 mAh battery and a micro USB cable. 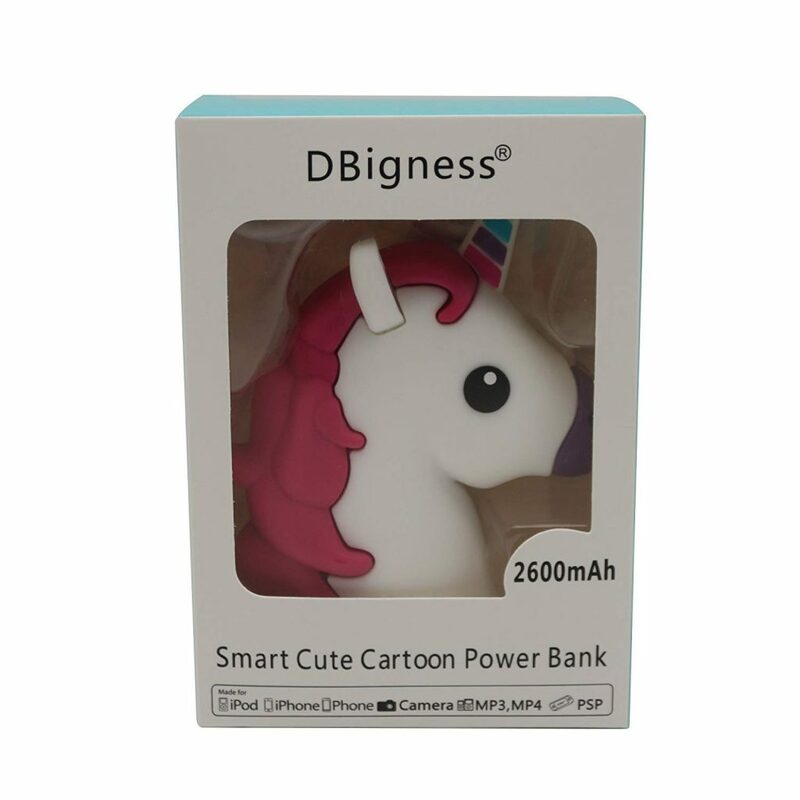 The DBigness accessory is a great option for people who would like to use the battery charger to charge a device other than their smartphone. 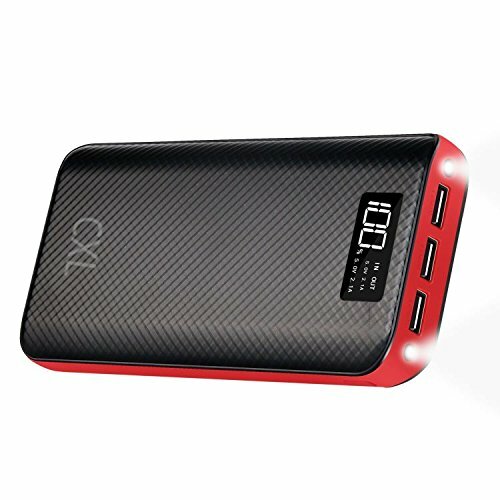 This affordable power bank is worth considering by those wish to give their friends a unique and yet useful gift. The Fourheart portable battery charger has a single USB port that allows you to charge one smartphone, tablet or digital camera at a time. When it is in use, the casing of the charger gets heated and the hand warmer gets activated. You can choose among three temperature settings for the hand warmer to warm your hands in less than five seconds. The warmer turns off automatically an hour after it gets activated to save the battery power. Alternatively, the warming can be turned on and off manually. The power bank features three indicator lights to notify you of the heating status and battery life. It comes with radiation-free, shockproof, explosion-proof, anti-skid and anti-scald properties. The charging device is designed with high-tech ABS and aircraft grade aluminum and features an eco-friendly 5,200 mAh polymer battery. The compact power bank has the shape of a capsule that gives it a unique look and makes it fit comfortably fit inside your pocket. It comes with a two-year warranty and a carry pouch. The battery charger is available in black, blue, gold, silver and rose gold color options. The Fourheart power bank is the best bet for people are actively engaged in outdoor activities like hiking, skiing, camping and fishing because of its compact size. The hand warming functionality makes the unit a good choice for those who reside in cold areas. The slim Sinoele power bank has a compact size and a stylish look. The longer sides of the charger are curved to hold it comfortably. The portable unit offers protection from short circuit, overcharge and overload. 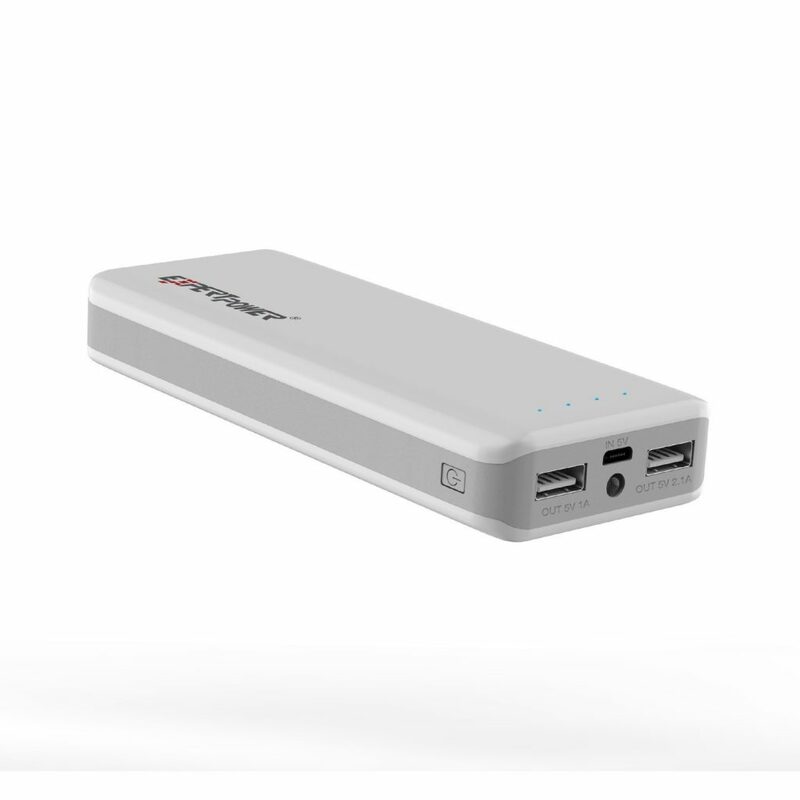 The 5,000 mAh capacity battery charger works with two rechargeable lithium-ion batteries. The batteries allow a recharge of more than 500 cycles without losing their effectiveness. It works with various 5 V devices like Android smartphones, Windows devices and Apple or iOS run devices. The ultra mini lightweight charger features an ABS body for durability and is available in multiple color options of rose, blue, pink and white. The device comes with a micro USB cable attached to it and an instruction manual. 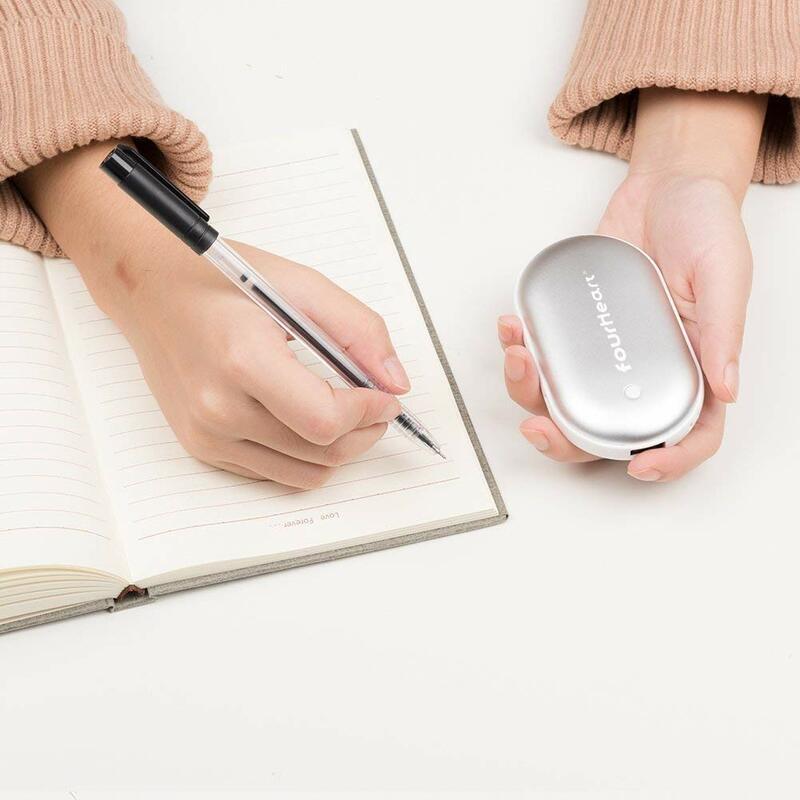 The Sinoele accessory is the best bet for people who want their portable battery charger to be stylish, lightweight and ultra-compact at the same time. The Besiter portable battery charger has a user-friendly design with an inbuilt chip that identifies the ideal charging mode for the device being charged and charges it accordingly. The built-in circuitry avoids possibilities of leaks, short circuits and overcharge, as well as offers resistance to high temperatures. The Quick Charge 3.0 functionality speeds the charging process by 27 percent. 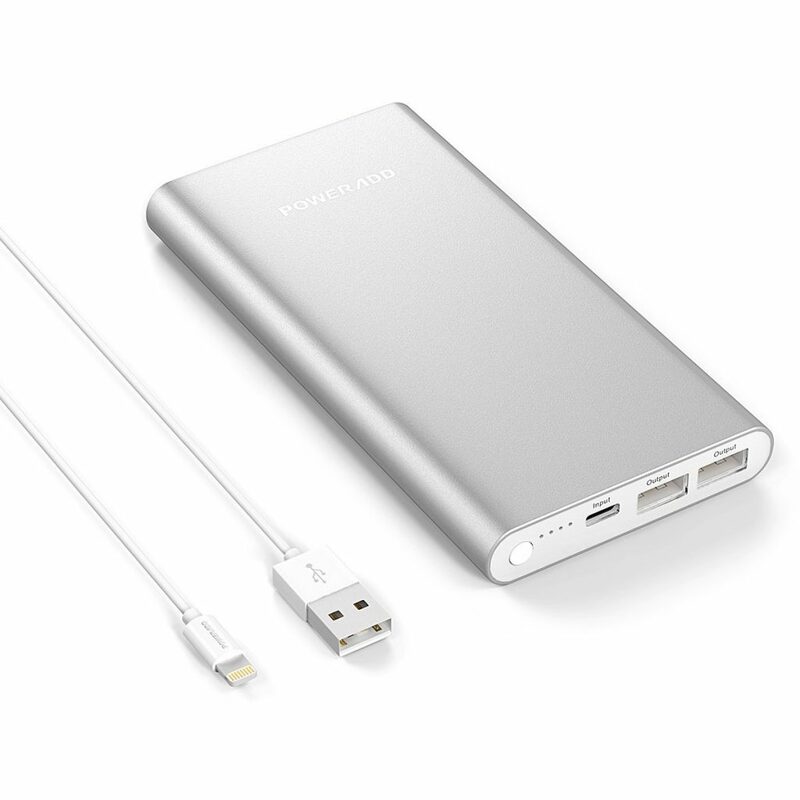 The 20,000 mAh capacity charger comes with two inputs and two USB output ports that you can use simultaneously. The high-precision LCD display gives accurate information about the charge remaining in the charger. It also has an LED light fitted on its casing. The power bank has anti-skid design and is scratch-resistant. The portable charger is made of a combination of polycarbonate and ABS. It comes in two color options of black and white. 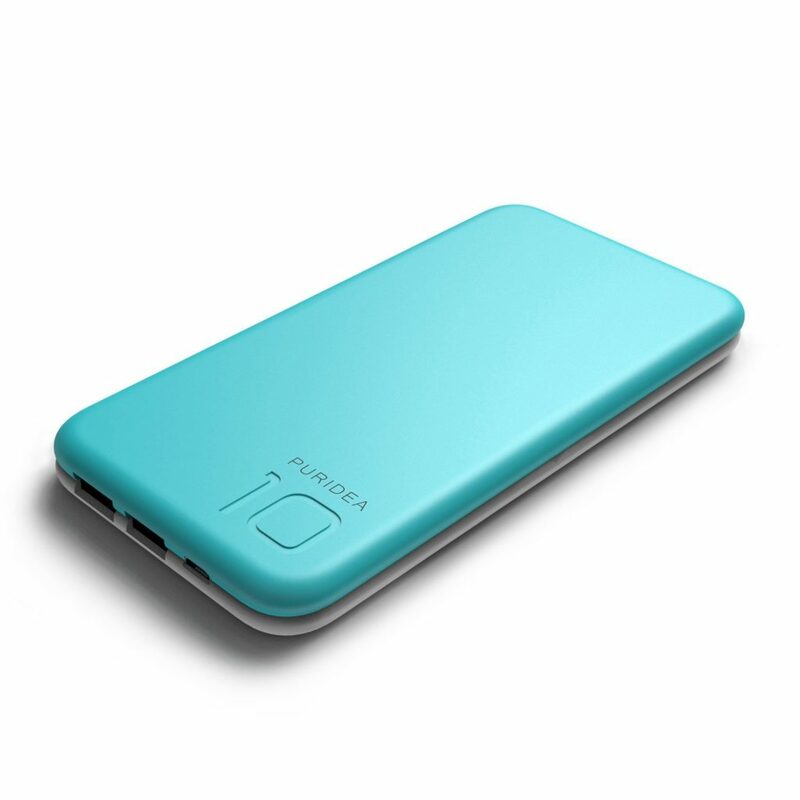 The power bank uses two lithium batteries for its effective functioning. It comes with a micro USB cable, a user manual and is backed up by an 18-month warranty from the manufacturer. The Besiter battery charger is worth considering by people who would like to charge their smartphones or tablets at a faster rate than usual. The power bank is worth giving a thought by those who want to know how much charge is remaining so that they can decide when to charge it. This portable power bank has an ultra-compact design that makes it very easy for you to carry it wherever you go. The Yosib battery charger has two USB ports to charge your Android and Apple devices. It protects the units getting charged from over discharge, overcharge and short circuit. The 10,000 mAh capacity charger works with polymer batteries at a power rating of 37 Wh, input and output voltage ratings of 5V and input and output current ratings of 2.1 A. The device also has an LED flashlight that you can activate by pressing the Power button continuously for three seconds. 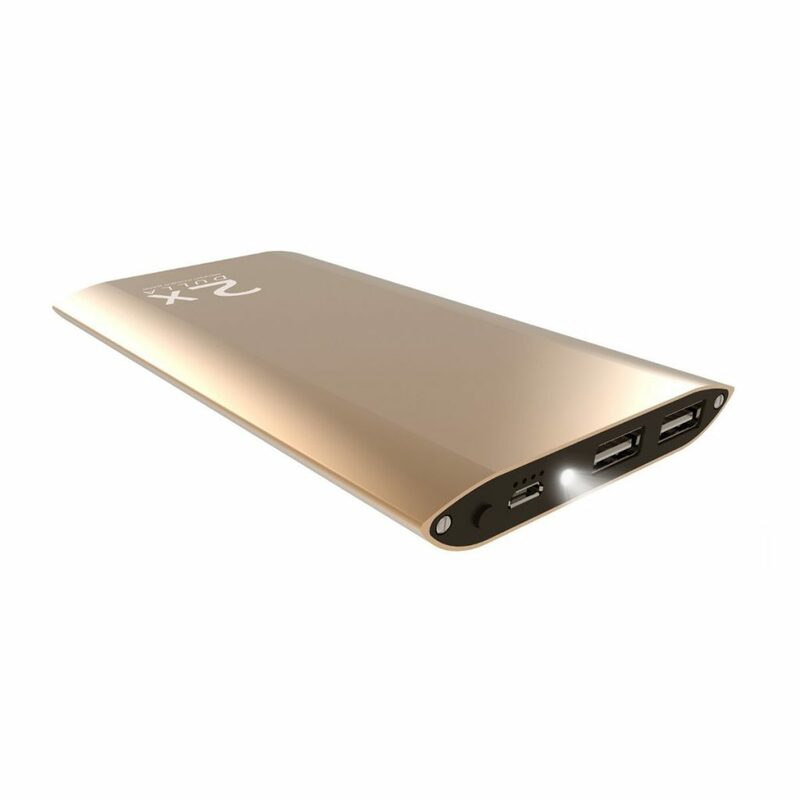 The portable battery charger has an integrated metal body and is available in four color variants of black, gray, rose gold and gold. The unit comes with its user manual and a micro USB cable. 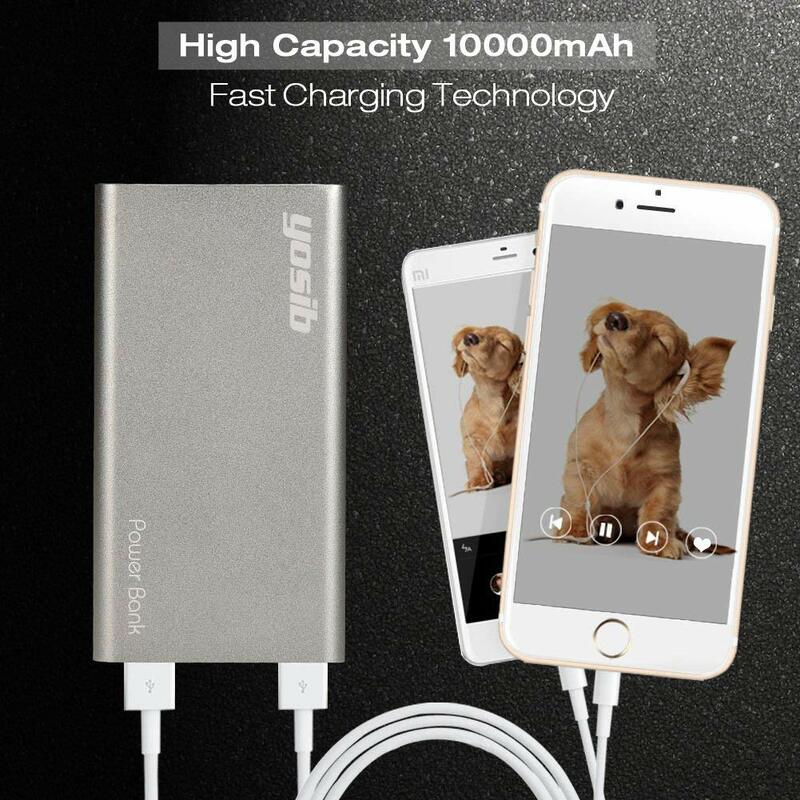 The Yosib power bank is a good choice for people who want to charge two Apple and/or Android smartphones and/or tablets at the same time. The metal body makes the portable battery charger worth giving a thought by those who do not want any compromise in ruggedness. The charging accessory is ideal for night-time users or during an emergency because of its inbuilt LED flashlight. 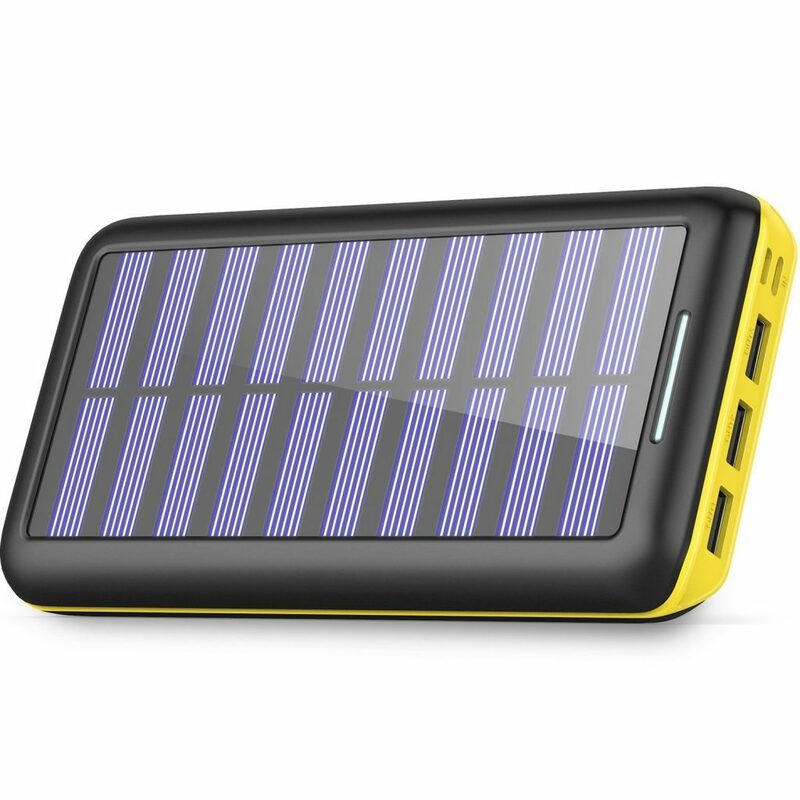 The Errbbic solar power bank comes with a solar panel that recharges the device when you place it in sunlight. It has two USB ports to charge two smartphones rapidly at a time and two LED lights that help you to use the portable battery charger as a flashlight. There are five pilot indicators that let you know the status of the battery charger. A green light indicates that the charger is getting charged using solar energy whereas a blue light indicates that the unit is charging another device. The unit is lightweight, compact and explosion-free. The black and green battery charger comes with a lithium-polymer 20,000 mAh battery that has a lifespan of more than 500 recharge cycles. It comes with a USB cable and a user manual. To charge the battery fully, use the DC power outlet for at least 10 hours the first few times. Avoid overcharging the unit beyond this time and in the car to avoid crashing. Also, do not use it to charge your smartphone as you charge the battery charger itself. The solar charging option must be used only when there is no way to access a DC mains outlet. The Errbbic solar battery charger serves the needs of people who would like to charge their iPhones, iPads and/or Android smartphones. The hook makes the battery charger ideal for those who want to clasp the unit to their backpack or handbag. The waterproof feature makes it suitable for people who are apprehensive of the power bank getting damaged when it comes in contact with water. This portable battery charger supports charging three USB devices at a time. The charger comes attached with a lightning cable and a micro USB cable. It also has a Type C USB port. 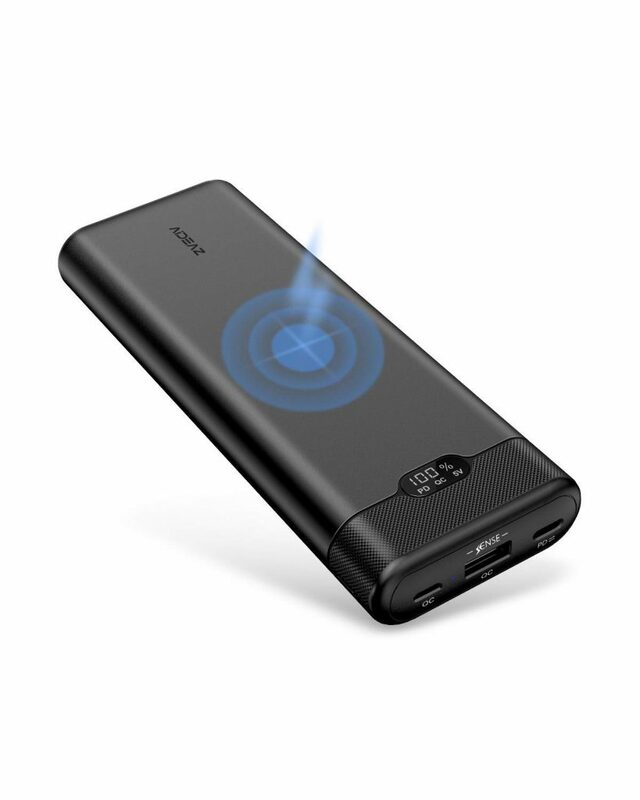 The power bank features four inbuilt mini LED indicators that keep you informed about the charge remaining in it when you connect the unit to a smartphone. When the device is turned on, all the LED lights light up and then switch off automatically. The 10,000 mAh battery charger operates at a power rating of 37 Wh and input and output voltage ratings of 5V. The intelligent safety protection technology offers safety against short circuit, over current, over discharge and overvoltage. The unit is compatible with almost all chargers. 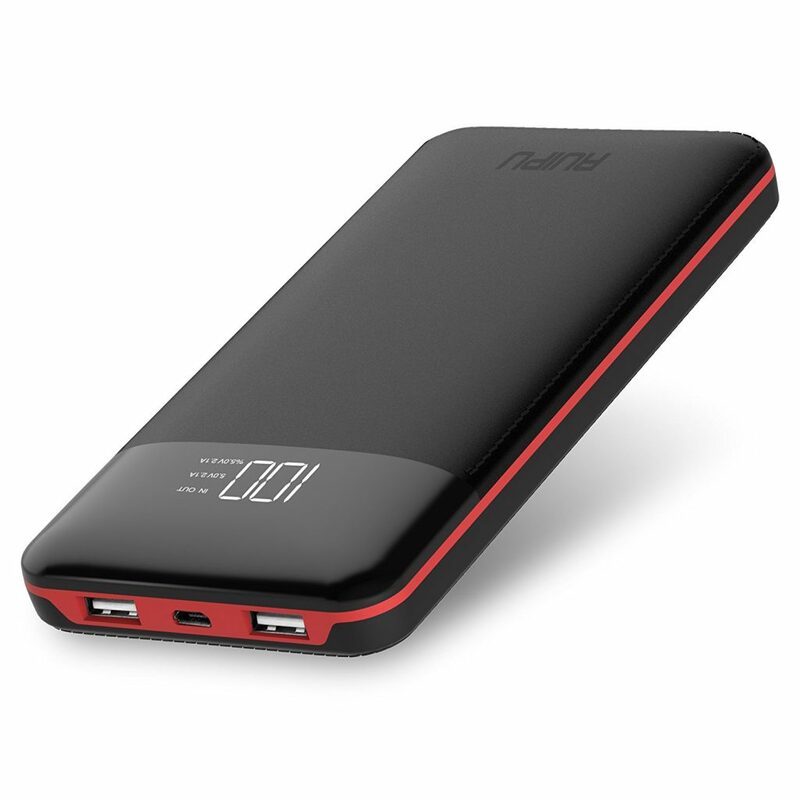 The portable charger comes with an aluminum alloy and hard plastic body with a rubber cover. This makes the charger rugged and durable. It is available in three color options of black and red, grey and white and white and orange. 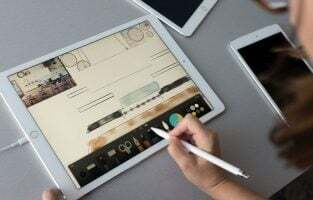 The unit comes with a detachable micro USB cable, a detachable Apple cable, a detachable Type C USB cable, a cable converter and a storage pouch. The cable converter makes the Charmast charger a great option for people who want to charge different types of devices. The slim design is apt for those who would like to carry the power bank comfortably in their pocket. The rubber cover ensures that the battery charger is ideal for those who are apprehensive of the device getting damaged due to falls or prone to scratches. 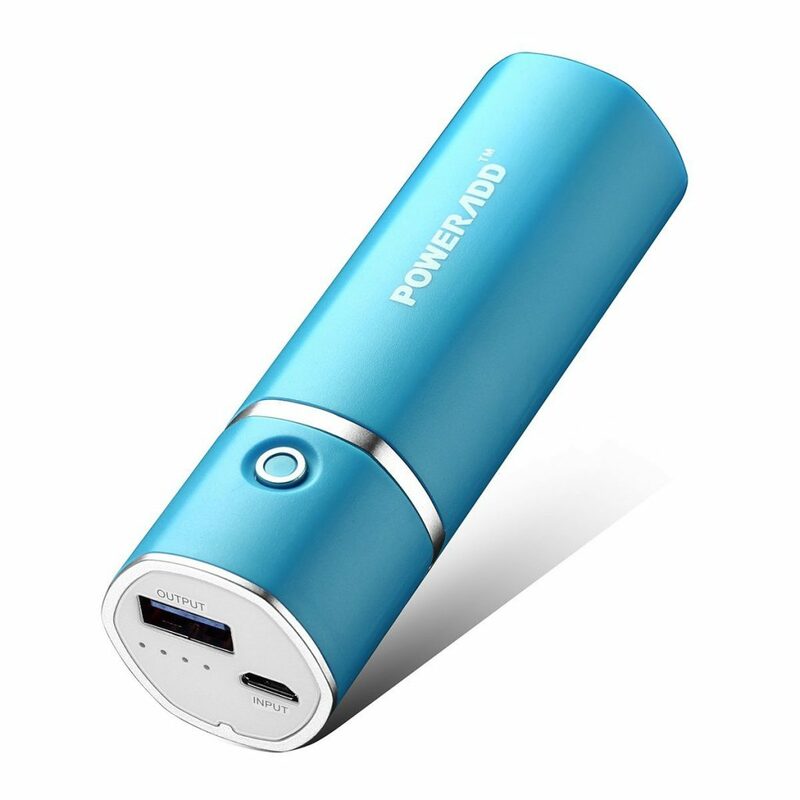 This cylindrical portable battery charger supports charging of just about any device with its USB Type-A port, USB Type-C port and AC outlet. The Novoo charger allows you to use all three ports at a time without getting overloaded with its 20,100 mAh capacity battery. It has an operating voltage of 60W. The AC outlet has an output voltage of 110 to 120V while the output voltage of each of the USB ports is 5V. The unit comes with short circuit and surge protection functionalities. If the power rating exceeds 60W when the device is in use, it gets turned off automatically. The cylindrical power bank has a compact size and fits into the pocket with ease. The black and silver color combination makes it look classy while the double shell body assures you of the durability. It comes with a 12-month warranty from the manufacturer. The Novoo portable charger is the right option for people who would like to charge their laptops apart from their smartphones and tablets. The cylindrical design and compact size makes it a good choice for those who want their power bank to look different from others’. The Bonai power bank has four USB ports with a total current rating of 4.8 A. Two of the ports are lightning ports to support fast charging while the other two are micro USB ports. The curved longer sides make it easy to hold the portable battery charger. 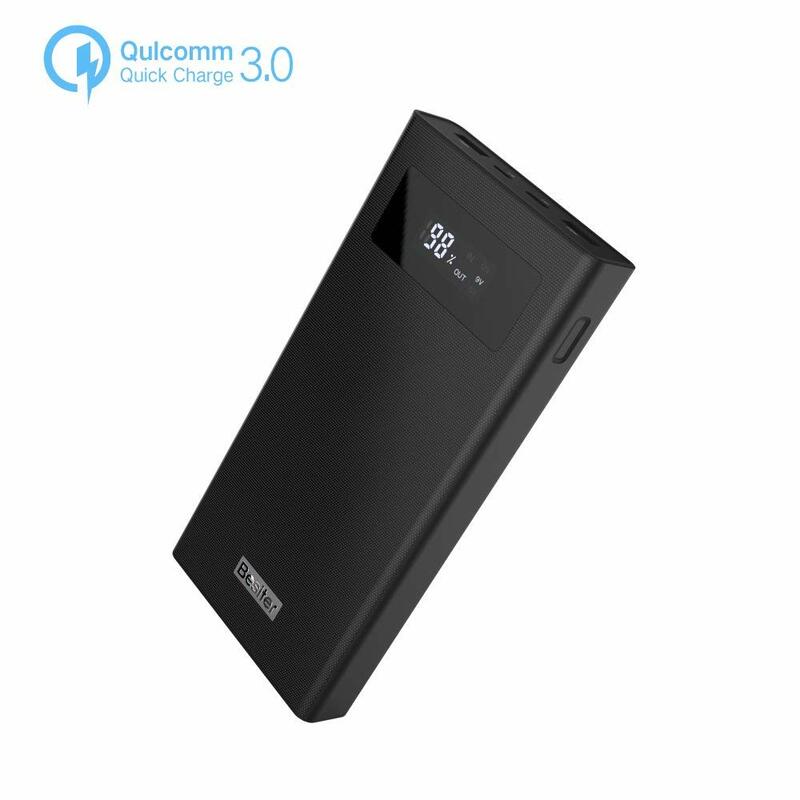 The 20,000 mAh capacity lithium-polymer battery has advanced safety functions that protect the device from problems against problems like a short circuit, overcharge/discharge and voltage instability. It has built-in indicators to let you know when the charger runs out of juice. The device must be fully charged before it is used for the first time. The compact battery charger has an aluminum body that keeps it off damage due to knocking and falling, as well as dust accumulation. The unit comes in four color choices of red, silver, mint blue and rose gold. The four ports make the Bonai portable battery charger a good idea for people traveling with family or friends as it allows almost everyone to charge their phones at the same time. 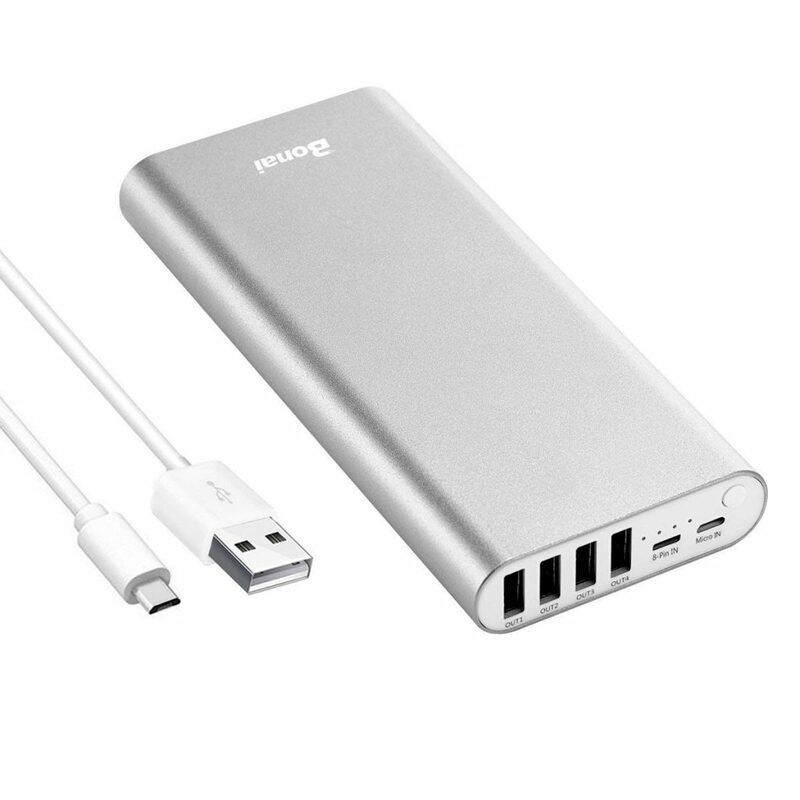 The power bank is ideal for those who want their devices to charge at a fast rate because of the lightning ports. The AideaZ portable battery charger offers three outputs and two inputs that are capable of offering both QC quick charge and bi-directional PD quick charge power deliveries. The device charges USB Type-C and Type-A power delivery devices at an output power rating of 18W. It is equipped with a 20,000 mAh capacity lithium-polymer battery. The power bank supports wireless charging and high-speed charging to minimize the wire usage and speed up the charging time. There is no need to take off the cover of the phone when you opt for wireless charging. The pass-through technology allows you to charge both the charger and your phone simultaneously so that you do not run out of battery in either device. The mesh protection safety system assures you of complete protection of your unit every time. The black battery charger has an LCD display to highlight the remaining power in the device. The LED indicators notify the user of wireless charging, input/output PD quick charge, input/output QC quick charge and input/output 5V. It can charge tablets, smartphones, laptops and more. The charger comes along with a USB Type-C cable, a carry pouch and an 18 months warranty period. The AideaZ device is definitely worth giving a thought by people who would like to charge both their battery charger and phone or tablet at the same time so that they never run out of charge. The various notification indicators make the power bank looking into by those who would like to know the kind of charging offered for their handsets. The Romeo Power Saber power bank can charge different types of devices at a time with its AC outlet, two USB ports and a USB Type-C port. The charger has an output power rating of 90W. It works with eight lithium-ion batteries that have a total capacity of 24,000 mAh. The power bank gets charged at a very fast rate of just two hours using the charger provided. The lightweight unit is capable of adjusting the input and output power automatically to offer completely efficient and safe charging without fear of overcharging. The shockproof, ultra drop, dust-resistant and water-resistant properties make the portable battery charger ideal for both indoor and outdoor use. The unit works with most electronic devices like laptops, digital cameras, smartphones, tablets and drones. The cord fixed to the charger allows you to tie it to your handbag or backpack. It comes in black and blue color options. The rectangular shape gives the lipstick size charger a unique look. 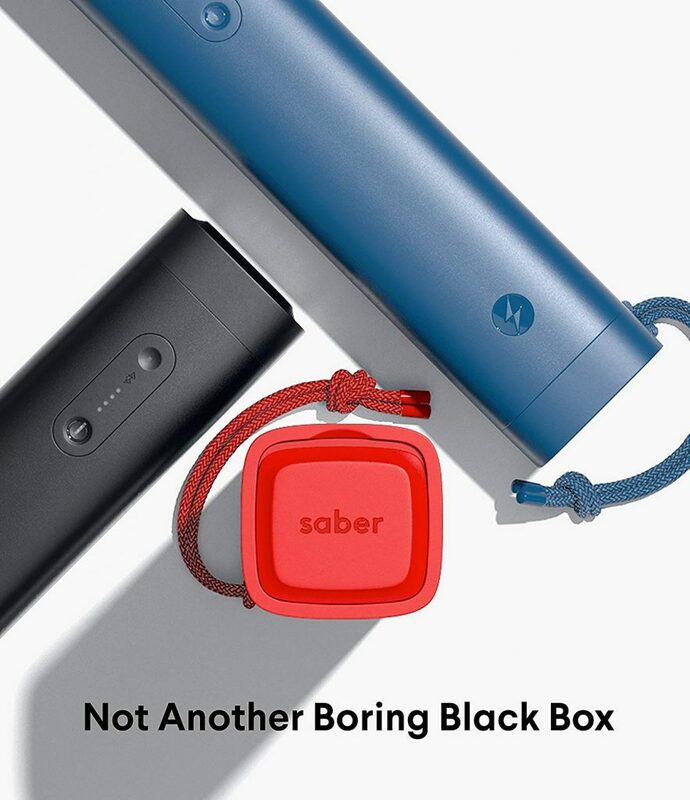 The ultra-rugged property of the Romeo Power Saber device makes it a good choice for people engaged in outdoor activities. The fast charging action of the power bank makes the charger worth giving a thought by those who want their charger to be fully charged always. 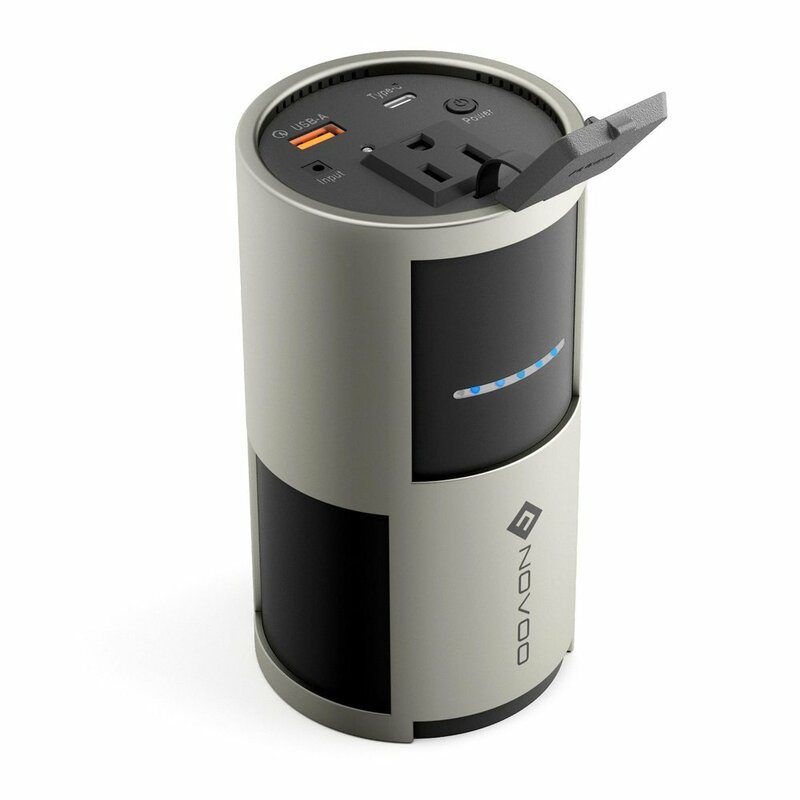 The PowerIQ and voltage boost technology together offer high speed charging to your devices. The battery cells in the power bank are of high quality and are from LG. It is a 10,000 mAh battery which is super light to carry around. 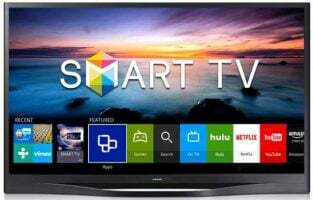 You also get an 18-month warranty from the company. 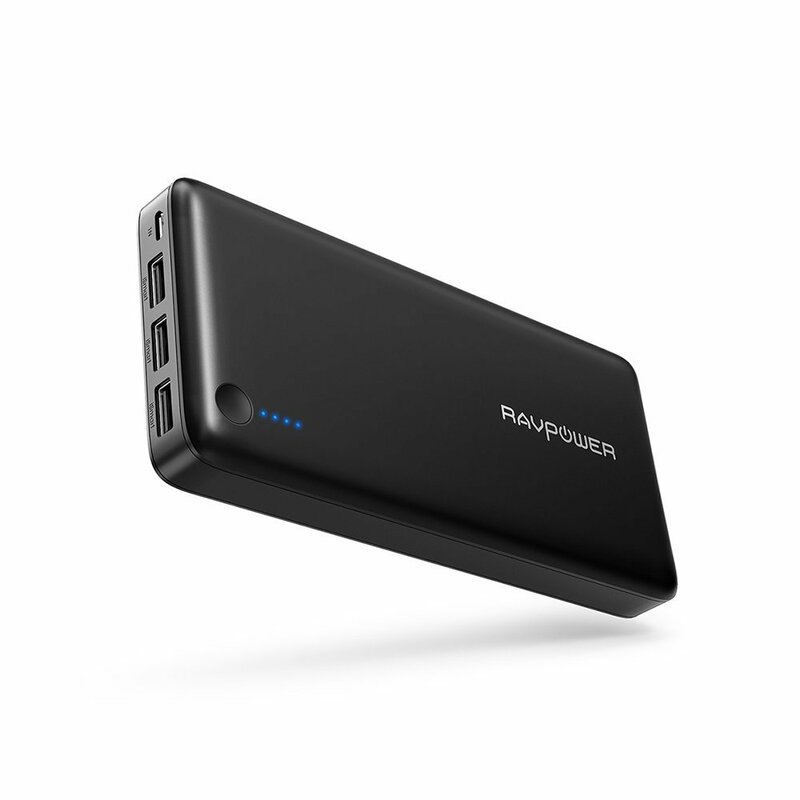 The portable battery from RAVPower supports 3 iSmart USB’s and can charge 3 devices simultaneously. It has a massive battery of 22,000 mAh and can charge smartphones for 4 times on an average. It charges itself with a 2.4 amp charger and needs about 12 hours to be full. There are 4 color variants to pick from. 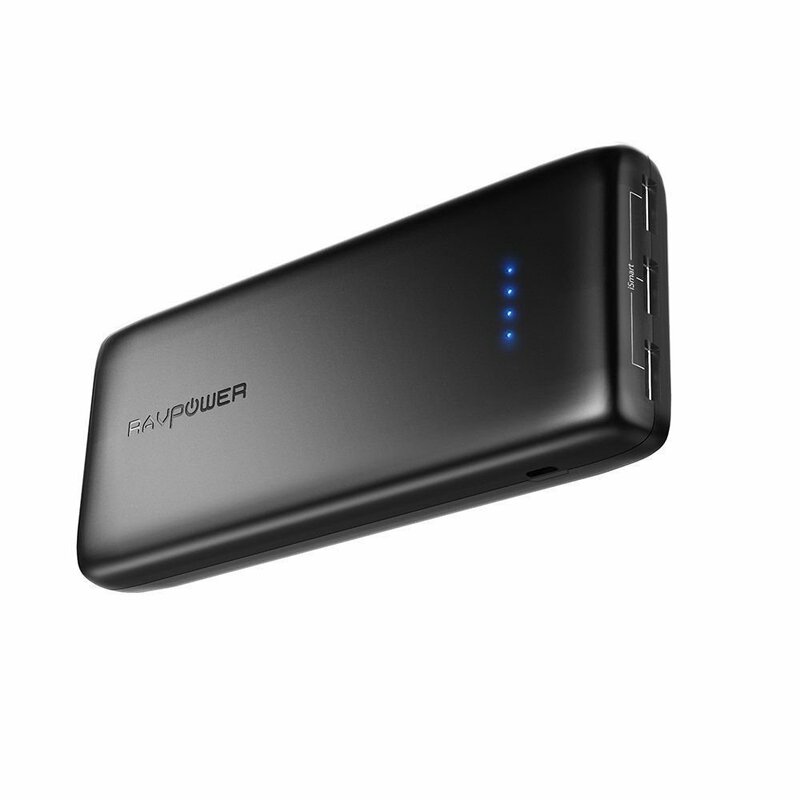 This is a powerful power bank and one of the best portable battery chargers with a battery of 24,000 mAh. It can charge a phone up to 5 times once it is fully charged. The make of the battery is sturdy and it is made of anti-skid material so you have a firm grip to hold it. It offers dual output and can be shared with someone while your phone is charging too. 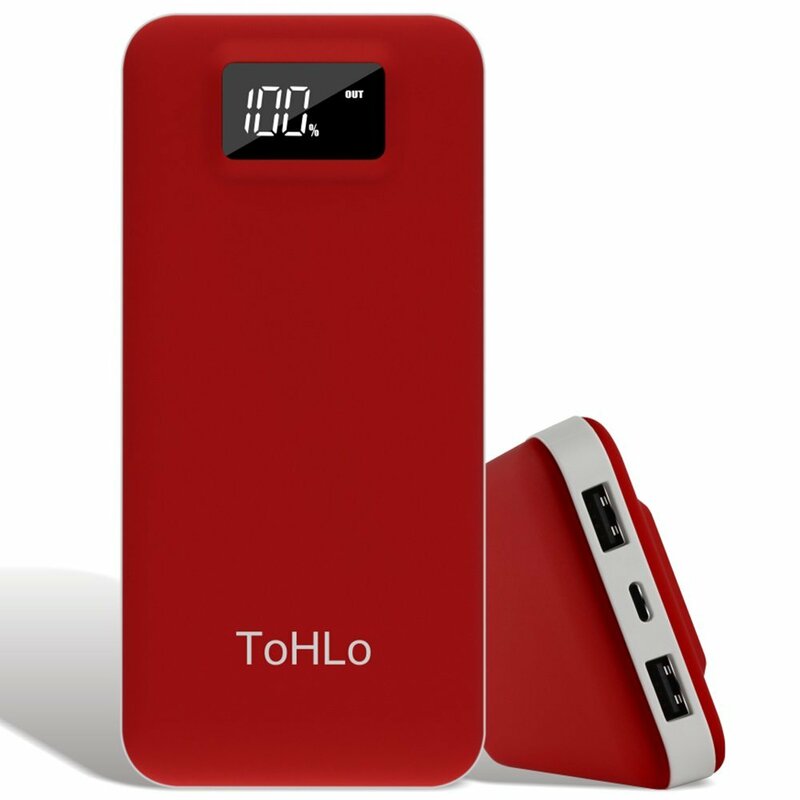 This battery charger from ToHLo has a smart digital LED display which displays the battery capacity accurately. It is made of durable rubber and has a modern design. 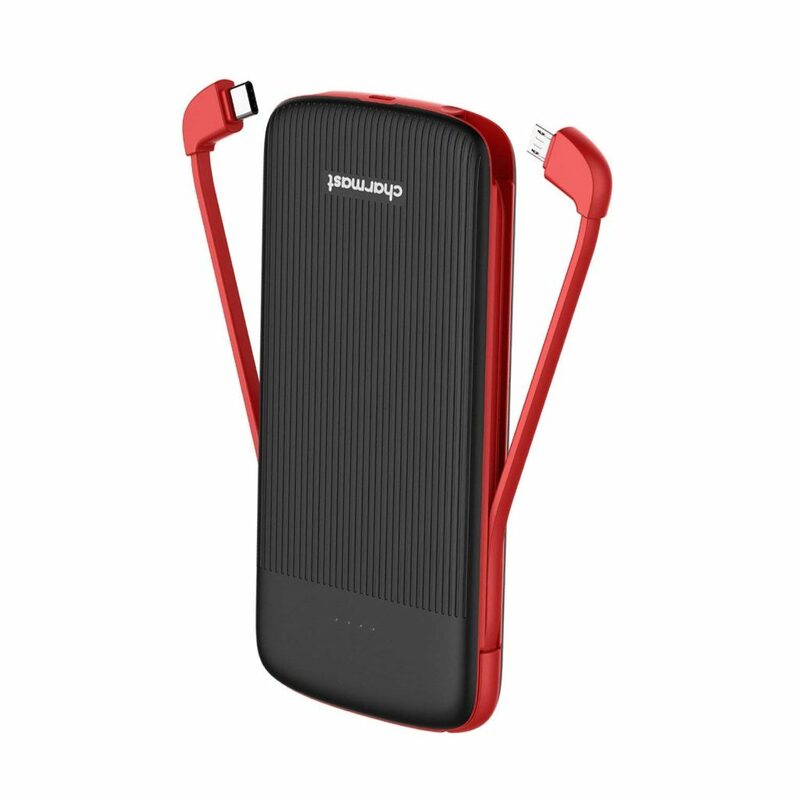 Its capacity is 20,000 mAh and has the capacity of charging a phone up to 5 times. It is compatible with both iOS and Android phones. 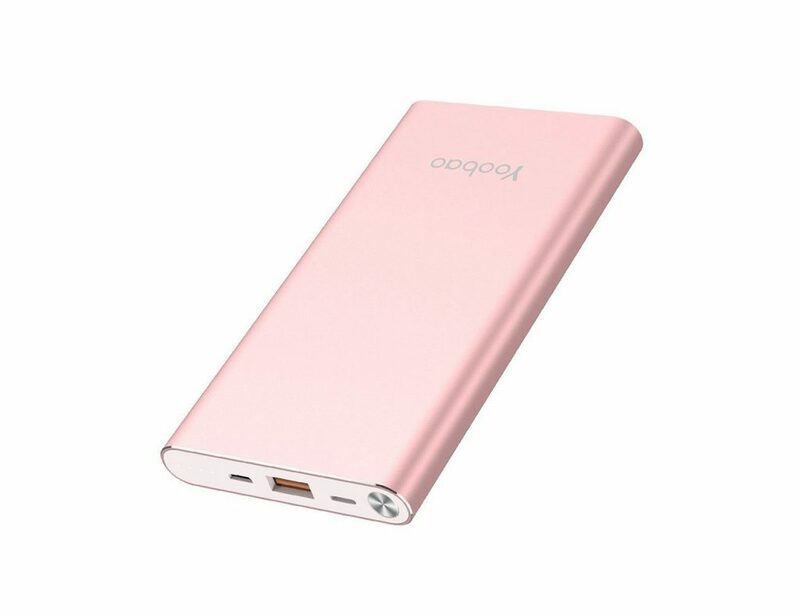 Available in colors white and rose gold this portable battery charger from Poweradd has a capacity of 12,000 mAh. It features dual port so you can charge two devices at a time. The power bank has an aluminum alloy body which is designed to be anti-fingerprints. The premium microchips multi-protect system protects your phone from short circuits, over-voltage and overcharge and discharge. 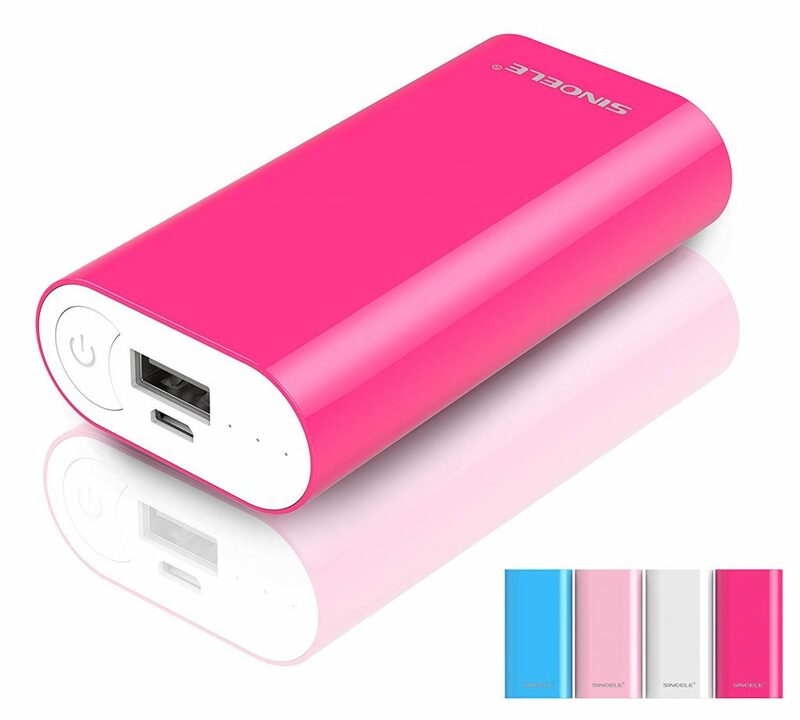 This is a beautiful lipstick-sized portable charger which is perfect for women to slip into their bags. These metallic looking power banks offer one charge to a device – superb for emergency situations. The Power IQ it features detects the device and charges it at the highest speed that it supports. 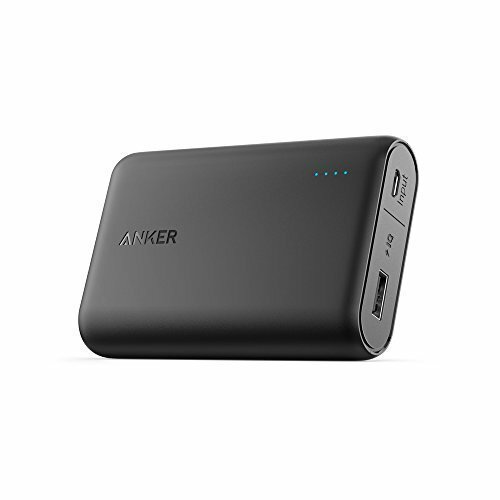 You get an 18-month warranty from Anker for this mini battery charger. It has a really big battery of 26,800 mAh and you can charge a smartphone six times in a span of 9 days. There are 3 ports which offer a total current output of 5.5 amp. With a 1 amp charger, it refills its energy in 24 hours whereas it takes about 15 hours to charge if a 2.4 amp charger is used. 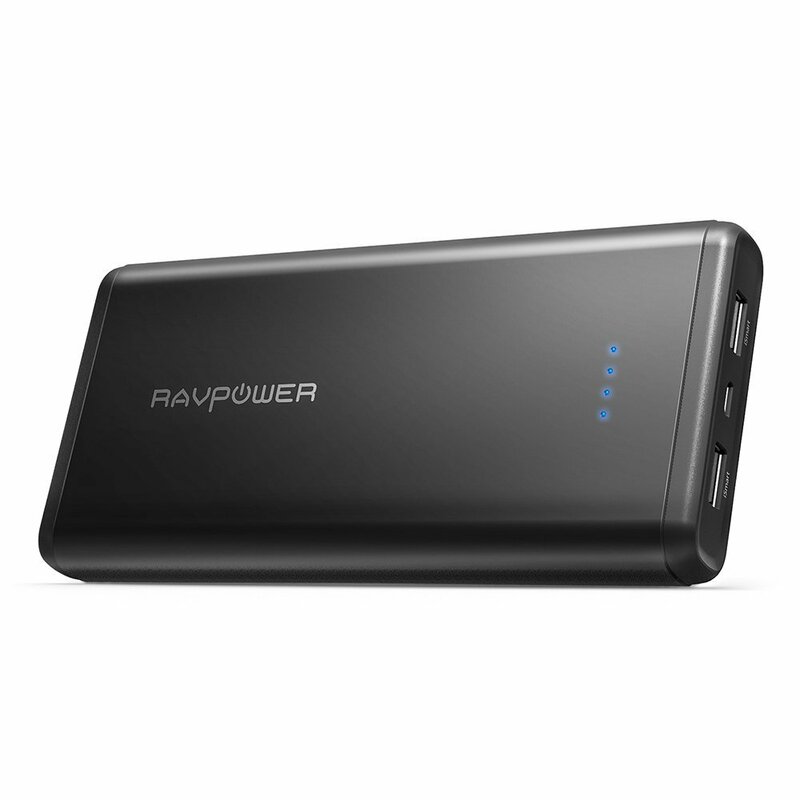 The RAVPower is one of the best portable battery chargers you can own for your devices. Get this charger in 12 different colors and prints. It has a Li-polymer battery of 10,000 mAh and there are 4 LED indicators that display the battery capacity. Puridea battery charger has a sleek look and is just about 13 mm thick. It looks just like a small phone and can be carried around easily. Besides just charging your phone this portable battery charger also features two flashlights which can be used at times of emergency. It has a battery of 24,000 mAh and 3 outputs offering the multi-charging facility. The company offers a warranty of 2 years which vouches for its durability and quality. This is a dual port battery charger with a capacity of 20,000 mAh. The LED lights display the capacity of the battery. There is a flashlight which can be used in darker environments. It has an ergonomic design and can be carried around easily. Once charged it holds its charge well until every bit of it has been used in charging your devices. Get this charger in four attractive colors. It has the capacity of charging smartphones up to 5 times. The intelligent power IC manages short circuit, overcharge or discharge and over current problems. There are two ports which you can use to charge two devices simultaneously. The charging capacity of this battery charger is superb. It has a Polymer battery which is considered as the safest battery. You get a 30 days money back guarantee. This power bank from RAVPower offers 20,000 mAh battery and comes in two colors. It fully charges itself in just about 9 hours and offers 5 charges on an average to your smartphones. There are three ports located together for convenient charging of 3 devices. With this stylish portable charger for your phone, you don’t have to worry about overcharge or voltage surge. 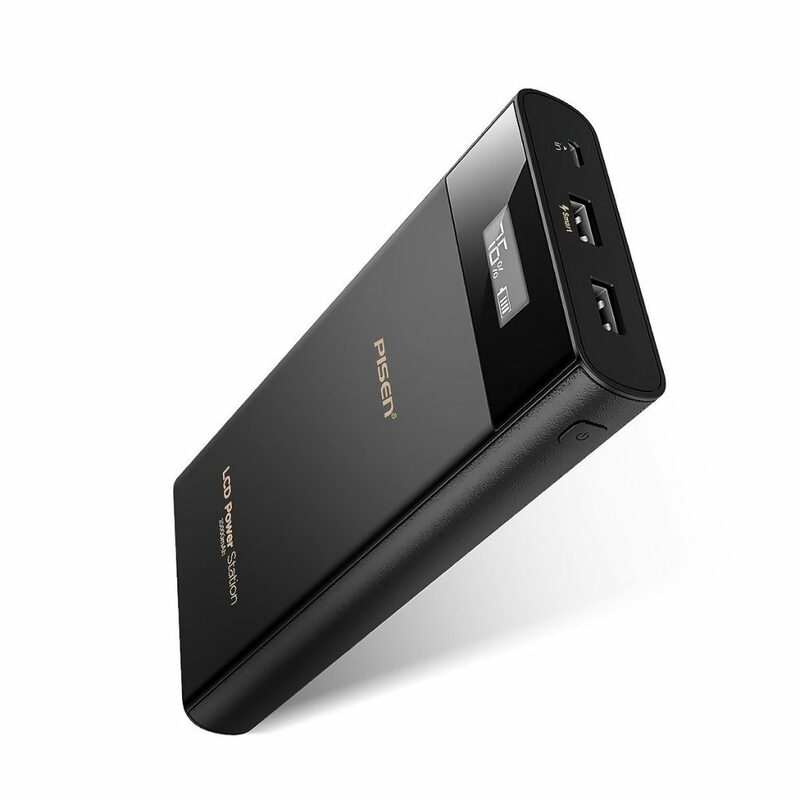 With a dual port and LED display facility, this power bank has a battery of 20,000. The LED display lets you see exactly how much battery is left on the charger. The company gives an 18-month guarantee on the quality of the product. 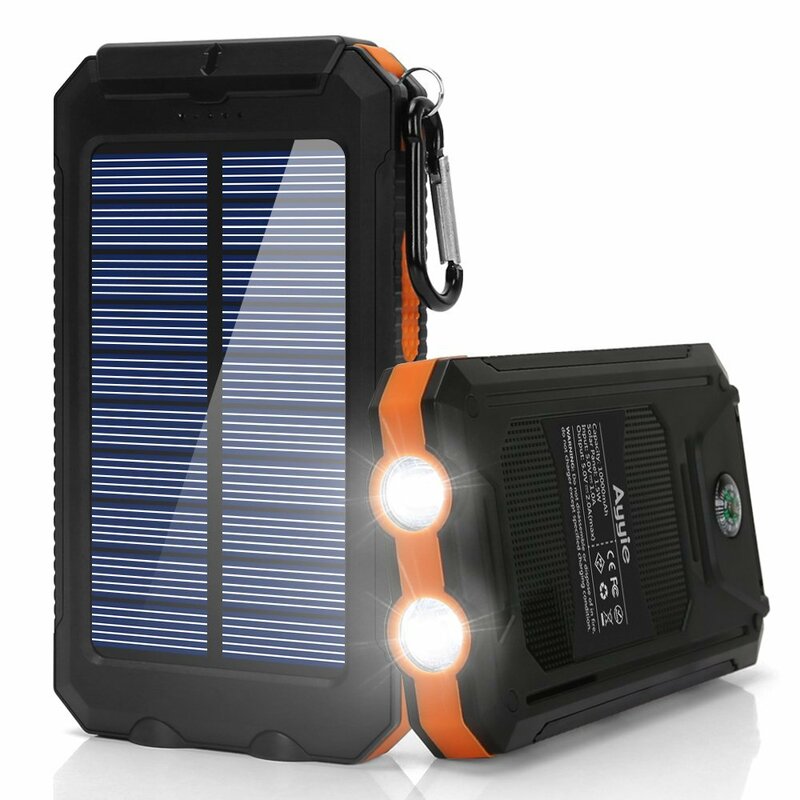 Ayyie portable charger is a solar phone charger which has two LED flashlights, carabineer, and a compass also. It is made of high-quality ABS, PC and Silicone material. The charger is shock/dust/waterproof. There are two outputs and it features Automatic Smart Identification. 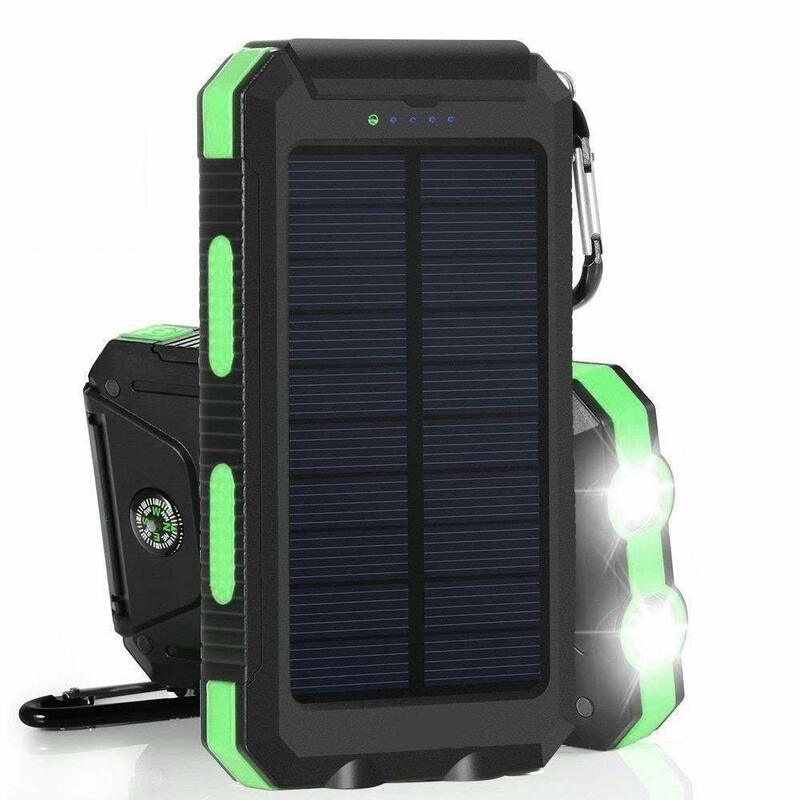 Use its solar power to charge it only when in need of emergency else use a DC adapter to energize it. Buy this Solar charger from Plochy which has a battery of 24,000 mAh. It has the capacity to charge iPhones up to 10 times and a Samsung Galaxy phone for 6 times. There are 3 USB ports through which you can charge your devices. This is a compact charger which has a battery of 5000 mAh and it comes in four metallic colors. Once fully charged it charges up any Android or iOS phone once. Also get a 2-year limited warranty on the product. This power bank charges with any micro USB cable. 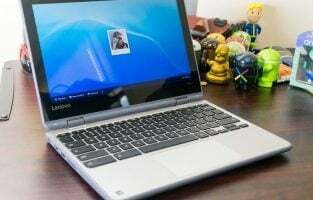 It has a slim look and is also very light in weight. 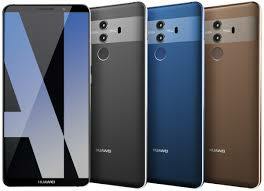 It has A+ li-polymer cells and premium microchips and a capacity of 10,000 mAh. Offering 10 layer protection it saves your device from overheating, overcharging and voltage surge. There are 5 fantastic colors available. 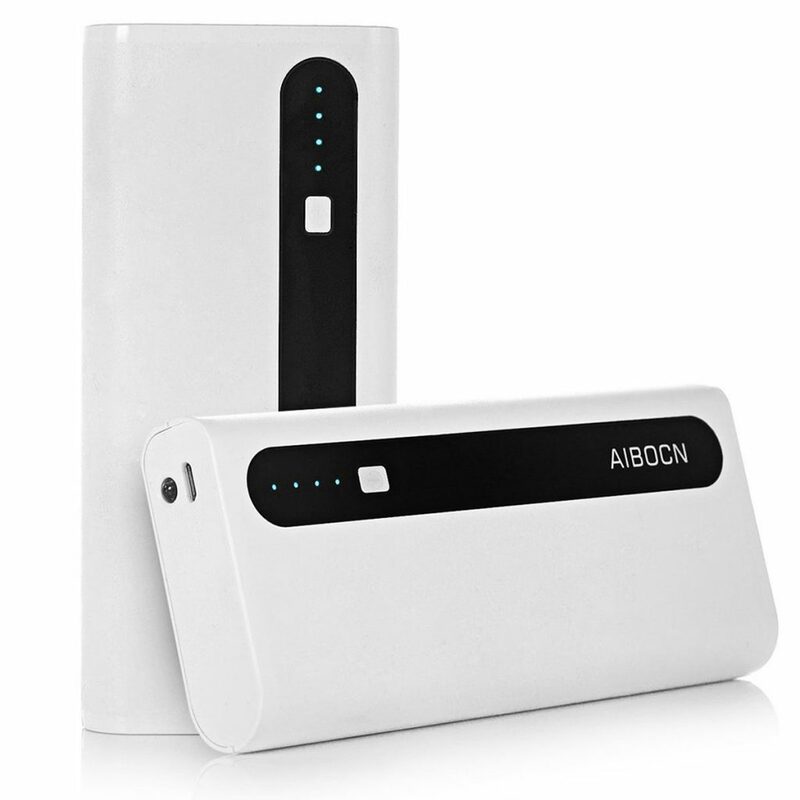 The power bank from Aibcon comes in unique combination colors. There are 2 ports on it and can be used for charging two devices simultaneously. There is a flashlight on it which can be used in an emergency especially when you go out camping or hiking. The power bank serves the need of both a torch and a battery backup device. 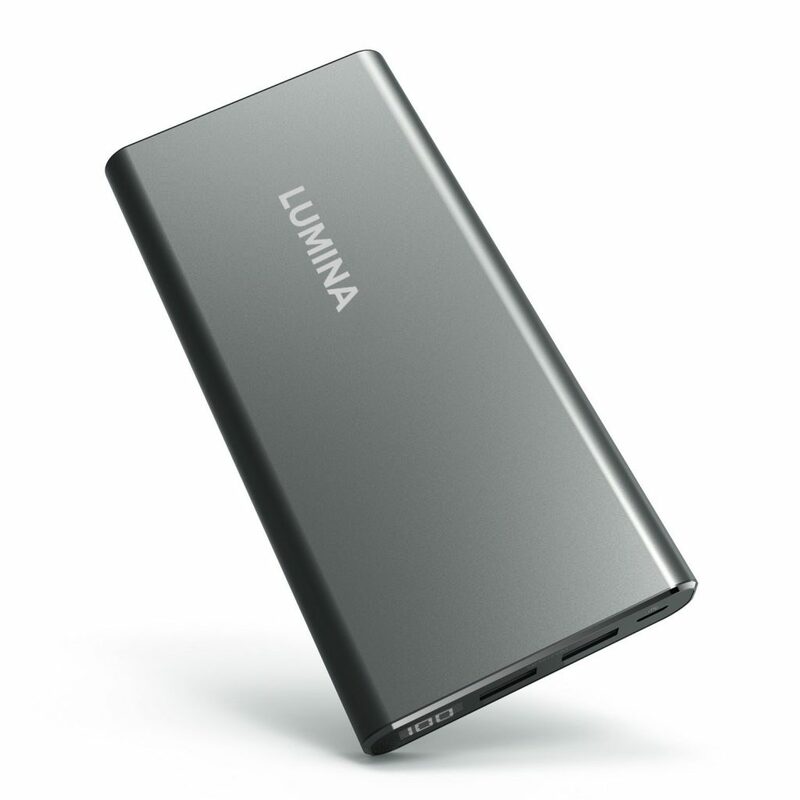 The Lumina power bank has a capacity of 10,000 mAh and has 2 USB outputs of 2.4 amp each. It is compatible with all types of OS devices. You get a lifetime warranty on this battery charger.